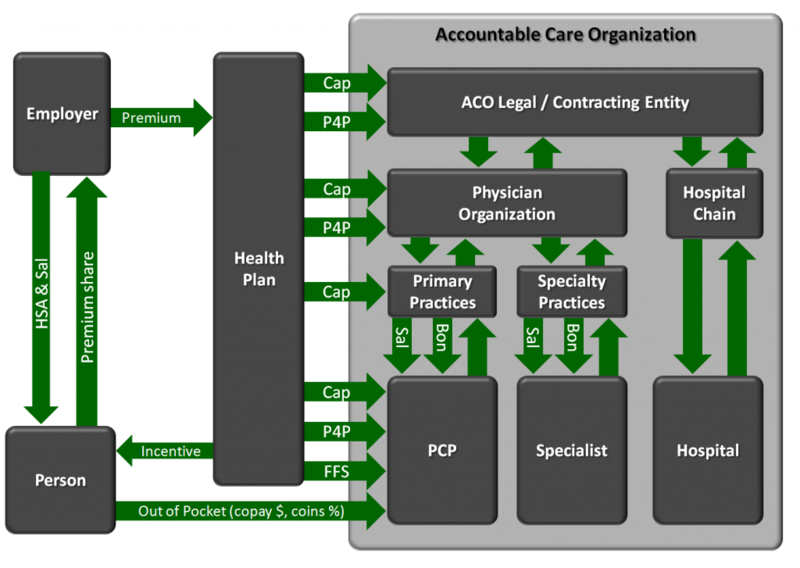 Accountable Care Organizations (ACOs) involve a large number of different participating parties, including primary care physicians, specialty physicians, and the practice units and physician organizations to which they belong, as well as hospitals and the hospital chains to which they belong. In addition, the formation of the ACO may involve the creation of a new legal entity capable of contracting with health plans on behalf of the other entities that comprise the ACO. These parties within the ACO must create a complex set of economic relationships, possibly embodied in a new set of contractual relationships or internal policies, to share both burdens and rewards. This new set of value flows exists within the already-complex set of value flows connecting employers, employees, health plans, and the provider entities that submit fee-for-service claims. The following diagram illustrates these value flows. Successful management of an ACO requires understanding these value flows, and quantitatively estimating the magnitudes of them to assure that the likely flows will create a target state that is considered to be fair and equitable to all of the parties. As ACOs focus on reducing unnecessary utilization and costs to manage the population, performance-driven revenue will rise. But, presuming that the clinical practice changes were made such that they applied to all patients or the changes “spilled over” on other patients, the reduction in unnecessary utilization will cause the volume-driven revenue for non-ACO patients to fall. ACOs that reduce utilization will also find that their capacity is greater than their need. In other words, they have unused or inefficiently-deployed capital. For example, if readmission rates fall, total bed days will decline, and a hospital may end up with too many staffed beds for their demand for bed days. Their management response will be to take steps to reduce their fixed costs, but such processes take time (which is the definition of “fixed” cost). An ACO can get into financial trouble if its utilization efficiency improvement outpaces the market conversion to performance-based reimbursement and the ACO’s efforts to reduce its fixed cost base. In consideration of this possibility, deals with health plans can be structured to reduce or share this transition risk. The key is to understand not only the economic flows in the target state, but also to understand the dynamics during the transition from the current state to the target state. This requires creating a dynamic model of the economics from all parties’ perspectives, with believable assumptions and the right balance of simplicity vs. detail. The current state of the art for such financial models in the ACO field is primitive. Reward Health Sciences will seek out partners to further develop this methodology and associated technology.